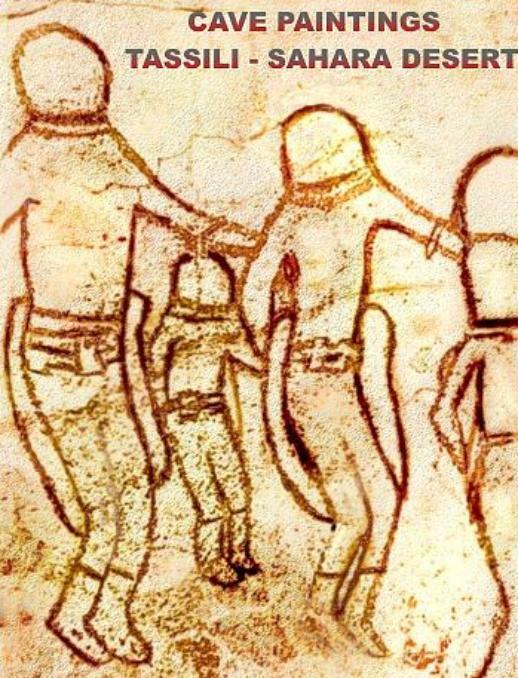 Cave Paintings of Tassili n’Ajjer depict mysterious creatures who appear like ancient astronauts with helmets gloves and strange suits. These are found in the Tassili Plateau, southern Algeria in the arid desert of the Sahara. Tassili n’Ajjer means ‘Plateau of the Rivers‘. Around 10000 BC, ancient African people represented their everyday lives through the cave paintings, among animals, plants, the ancient people also depicted strange beings that are unlike anything in the region. Researchers have catalogued over 5000 cave paintings, even though they believe that there were many more in the past. These painting make it clear that the Sahara region was completely different 4000-6000 yeas ago. It was a region overflowed with life. Regrettably, only 20% of them remain visible as the majority of these incredible cave paintings have been destroyed by erosion. Experts believe the cave paintings to be between 10,000 and 15,000 years old. There are countless species depicted in the caves; among them are giraffes, ostriches, elephants, oxen, alligators and even hippos; demonstrating that the Sahara region was full of life in the distant past. Usually cave paintings are done with a single shade of color, but the Tassili cave paintings used several colors which makes them even more special to history. These painting also seem to reflect a pattern of occupation in the caves with different activities performed by the ancients in specific historical periods. Hunting and Fishing around 7000 BC, animal husbandry around 4000 BC and horse domestication around 1500 BC. Most incredible paintings are perhaps the mysterious depictions of strange beings with helmets and suits, resembling modern-day astronauts. In some cases, these astronauts are even depicted with mysterious antennas on their helmets. One painting depicts an astronaut and a mysterious Disk in the sky. 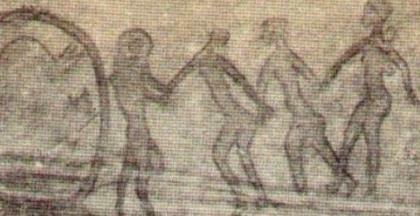 Another painting illustrates several women being taken to a mysterious looking craft (UFO). 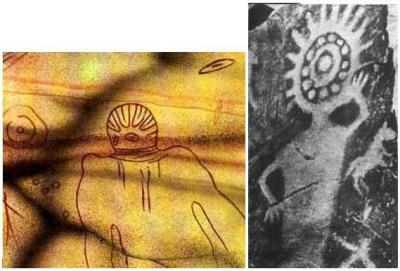 Paintings of these mysterious beings with gloves, boots, and helmets are also seen in the Azyefú, Ti-n-Tazarif and Sefar region in Algeria, Africa.